Bésame Cosmetics is a secret treasure. I fell in love with the brand at Dallas Pin Up. It’s a line of vintage-inspired beauty products created by cosmetics historian Gabriela Hernandez. There’s an old Hollywood glamour feel to every product, which comes in a red- and gold-adorned packaged and is kept cozy in a red velvet bag. 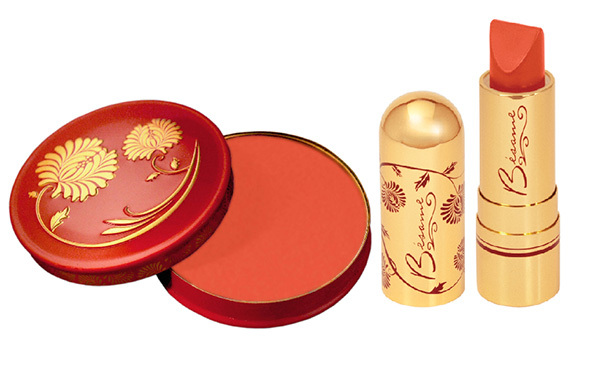 Lipstick cases are molded from ’50s bullet containers, and the colors are exact reproductions of the hues favored by classic starlets. I’ve got Tango Red, a color inspired by a variation from 1939, to give away today, along with the Apricot cream rouge in a coral hue. The Apricot Cream Rouge comes in a vintage reproduction tin and gives cheeks a sweet, just-flushed look when applied lightly. Enter here to win this dainty duo.